BEIJING, Sept. 1,Chinese President Xi Jinping met with Mozambican President Filipe Nyusi on Saturday ahead of the 2018 Beijing Summit of the Forum on China-Africa Cooperation (FOCAC). Xi said China firmly supports Mozambique in choosing a development path in line with its national conditions and stands ready to deepen the exchanges of the experiences on governance and development. China supports Mozambique in its efforts to pursue social and economic developments and improve people's livelihood and welcomes Mozambique to take an active part in the Belt and Road cooperation, Xi added. China is ready to help Mozambique accelerate industrialization and agricultural modernization to strengthen its internal drive to achieve sustainable self-development, Xi said. The Chinese president spoke of the need for China and Mozambique to advance key cooperative projects, innovate models of cooperation, and strengthen exchange and cooperation in education, culture, media and other areas. Xi also said China supports Mozambique in playing a bigger role in international and regional affairs. 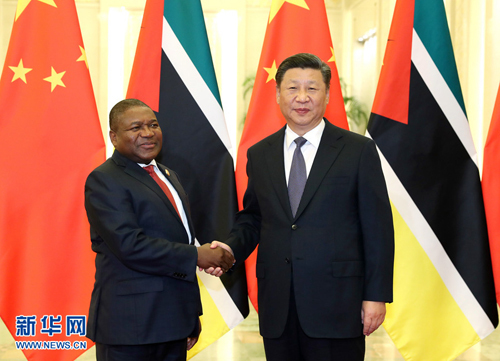 Nyusi said Mozambique is keen to learn from China on ruling party building and state governance. Speaking highly of the Belt and Road Initiative proposed by Xi, Nyusi said he believes this FOCAC Beijing summit will effectively advance the mutually beneficial cooperation between China and African countries and push for common development. Mozambique is ready to expand cooperation with China in areas including trade and agriculture, and strengthen mutual support in international and regional affairs, he added.